We all knew the Discovery Channel had green interests when it purchased Treehugger.com for $10 million, but now the Discovery Channel Store is featuring “eco-friendly” and “green gifts” toys for the 2007 holiday season. My family recently played with three of these products. Two of these toys (Pyramid Building Blocks and the Tolo Baby Carousel) will be featured in this post; one toy (the Hydrogen Fuel Rocket) deserves its own post, which will occur next week. Only a company that is profit-oriented can secure its future. We take the word social seriously! Both in terms of social benefits for our employees and in relation to our mutually successful relationship with our partners. The only unfortunate thing that I could discover about the Haba Pyramid Building Blocks is they are manufactured in China. The second toy we tested from the Discovery Channel Store was the Tolo Baby Carousel. Honestly, I don’t know why they sent us this toy to review, given my stance on plastic toys. This classic, plastic baby toy is also made in China, which of course raises the red flag of junk toy; however, this plastic does not contain any Bisphenol-A, Phthalates or Formaldehyde. 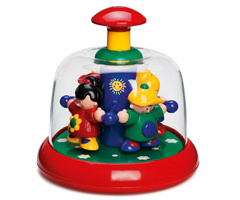 The baby carousel is made by Tolo, “the #1 selling toy line in Europe and the UK and the most earth-friendly non-wood pre-school toy you can buy”. Very young children do find baby carousels fascinating. They love to press the top of the carousel and watch it spin and keep spinning, discovering the properties of physics through their early play! Although this toy does not require batteries (an eco plus! ), I am not sure I can classify it as an eco-toy…I just can’t get past the plastic, no matter how “earth-friendly” it is. You decide: Is this a junk toy? Images courtesy of Discovery Channel Store. I hear you about the plastic. I do think there are some responsible toy makers in China, like Haba. But I will certainly be staying away from any if I don’t know about the companies reputation. Have you checked out Plan Toys? They are an eco-friendly, wooden toy co based in Thailand. I just opened a new baby/kids store and will be carrying their products. I am running a toy giveaway on my blog now too. Yes, I love Plan Toys. I’ve written about them many times. Great post! 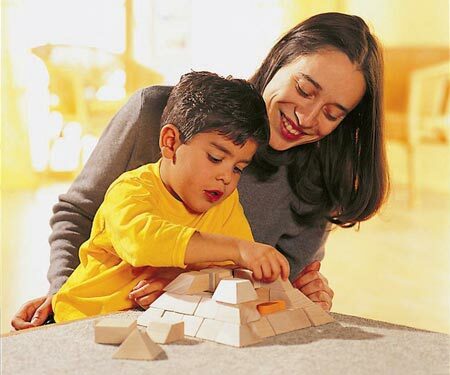 Blocks are both a eco friendly and incredibly educational toy. They last for years and can be played with in a variety of different ways. In general it’s not the hard plastic toys that contain Bisphenol-A or phthalates – these are softeners used in soft plastic toys…but in general,I agree, natural is better! MC, I thought that the hard plastics for drinking containers (i.e. Nalgene bottles and the hard clear baby bottles) were the one that had higher contents of BPA. I read that the softer plastics (like #1 used in bottled water) is safer, if only used a single time (but not environmentally friendly!). How many times have I thought about this (“Green” Toys From the Discovery Channel Store)? This is a great article and I appreciate the thought you put into it. Thanks! !